Candied Yams made with sweet potatoes, brown sugar, cinnamon, and mini marshmallows are the PERFECT side dish and ready in under 60 minutes! 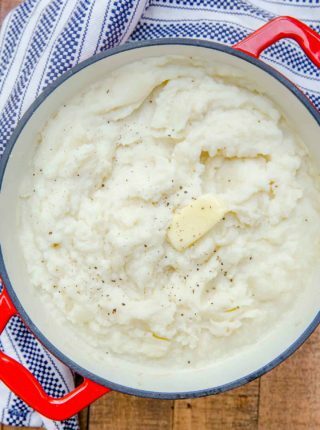 Our kitchen is heating up over the holiday season, and today we’re perfecting Thanksgiving side dishes like Easy Mashed Potatoes, Baked Mac and Cheese, and Green Bean Casserole. Candied Yams are an almost mandatory part of Thanksgiving dinner. 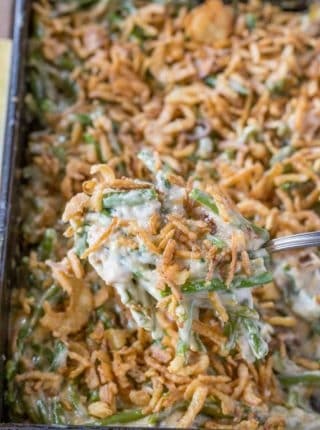 This dish has been a family favorite for generations, and is a total hit with the kids every single year. 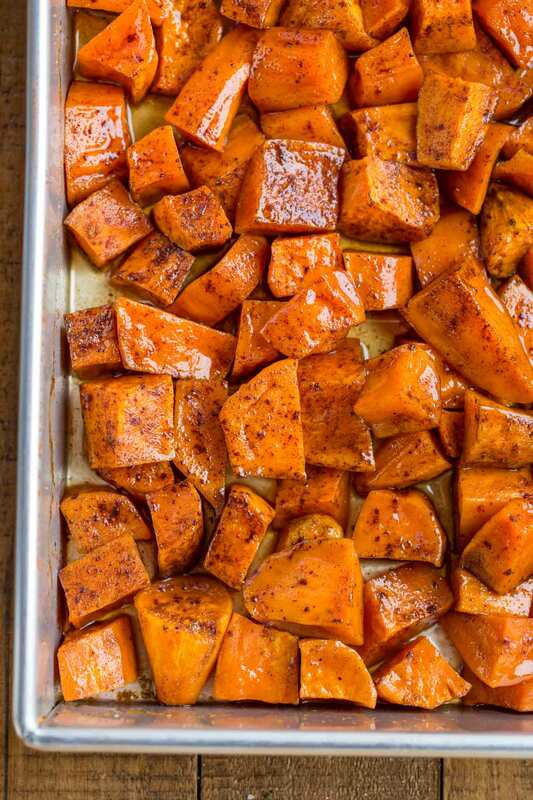 Yams are a naturally sweet flavored potato to begin with, but the deep flavor of brown sugar and butter with cinnamon makes this a syrupy side dish that dreams are made of. I know my Thanksgiving wouldn’t be the same without it, which is why I make a point to make it every year. Can you add marshmallows on top? Yes, you can absolutely top the dish with marshmallows just before serving. If you’re going to add marshmallows cook the yams in a baking pan instead of a baking sheet. When the yams are done cooking top the pan with a bag of mini marshmallows. One of the best tips I can give you is to stick with the mini marshmallows, and wait to add them until the end. They will melt evenly without burning on top of the baked candied yams. You can also turn the broiler on for a few seconds to get that toasty marshmallow look. Don’t worry about burning it, put the marshmallows 6-8 inches away from the broiler, keep the door open by about 6-8 inches, then watch the yams from about a foot away from the oven. In about 30 seconds you should start to see them brown. Be wearing a set of oven mitts while watching and open the oven and pull the pan out! You’re done! DO YOU COVER CANDIED YAMS WHEN BAKING? Do not cover this candied yams recipe while it’s baking, unless you see the dish starting to burn along the sides. If it starts to burn, it may be too close to the heating element on the bottom of the oven. You can also check to see if your oven is cooking on the right temperature with an oven thermometer. If you cover the yams while they’re baking you will end up with a lot of liquid in the baking pan. Let them bake without the foil, trust me. HOW DO I MAKE CANDIED YAMS FROM A CAN? If you’re in a rush, you can skip peeling and cutting the yams by using canned yams. Just drain the water or syrup from the can, and follow the recipe as written, checking to see if yams are done around 35-40 minutes. They are done when a fork goes through easily and marshmallows are melted on top. 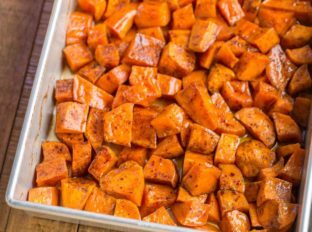 WHY ARE MY CANDIED YAMS RUNNY? 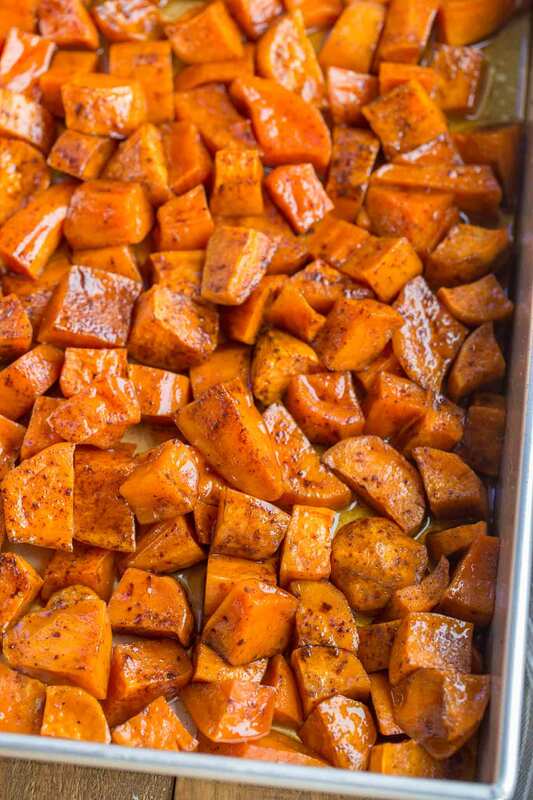 The combination of brown sugar and butter should create a syrup when the yams are baking in the oven. If your syrup is consistently runny, there are a few tips you can try to thicken it up before it gets to the baking dish. Replace the butter in the recipe with clarified butter (ghee), which naturally has less water than regular butter. Combine the butter and brown sugar in a saucepan over medium heat. Whisk until melted and slightly thickened, then pour over yams before baking. This should help cook some of the water out and thicken the syrup. Add more spices to get different variations of this candied yams recipe, like nutmeg or allspice. You can vary the recipe even more by adding cranberry, orange juice, clove, or even a splash of vanilla! If you have some picky eaters, you can leave the marshmallows off and sprinkle with a little extra sugar and cinnamon on top. If you don’t have brown sugar, you can use granulated sugar in its place. It will change the flavor but not drastically. You can also use honey but the flavor will be significantly different. If you don’t want to make this in a baking dish, you can also make sliced grilled yams, and drizzle them with the brown sugar butter syrup. Then top with a sprinkle of ground cinnamon and mini marshmallows and serve. If you don’t want to grill, you can cook the yams in a skillet. 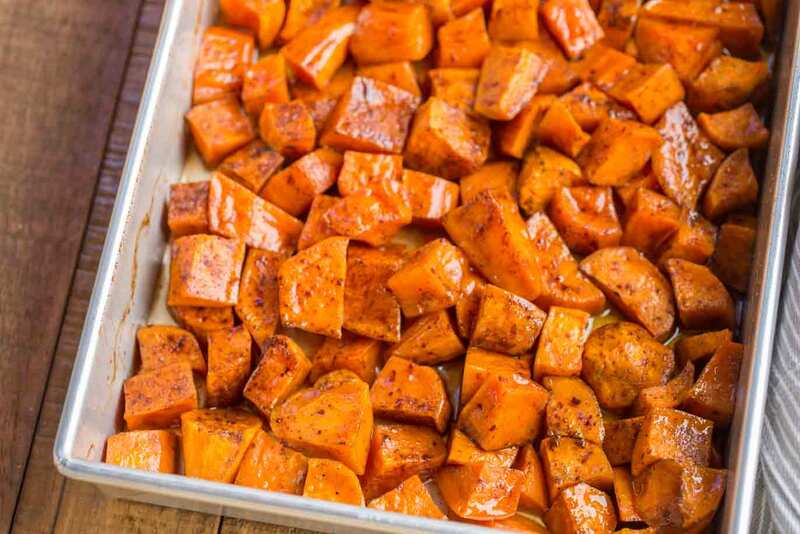 Preheat oven to 400 degrees and toss the sweet potatoes, butter, brown sugar and salt and place in 9x13 pan or on a baking sheet. 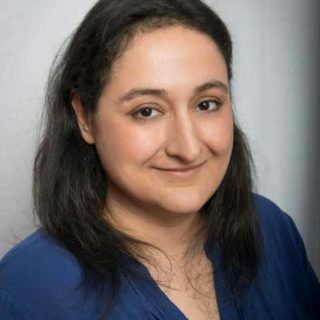 Sprinkle over the cinnamon evenly and bake for 50-60 minutes or until fork tender and if using marshmallows pile on after cooking and broil 6 inches away from top broiler for 30-40 seconds until browned. I’ve been eating candied yams since early 1950’s. My mother made these for every Easter, Thanksgiving, Christmas and New Year’s Day growing up. My favorite part of those meals is the yummy, syrupy, sweet potatoes. I have never gone a holiday without these on my table. Sweet memories that I’ve passed down to my daughters and grandchildren! I take a shortcut with boiling my sweet potatoes first… Until just about done. 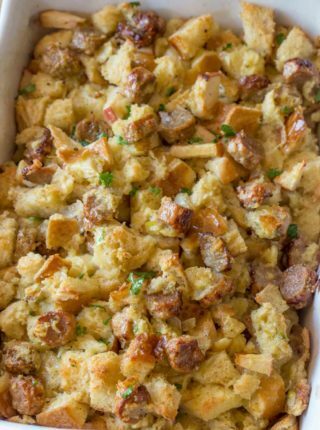 Place in baking pan that has brown sugar sprinkled on bottom of pan then layer potatoes and sprinkle sweet potatoes with cinnamon before adding more brown sugar to top of potatoes and finally drizzle with melted butter over entire dish (not every inch, but enough to get most of brown sugar moist. Bake @ 375 degrees about 30 minutes until sugar mixture is bubbling and thickened. As it sets for a bit the syrup continues to thicken. Deliciousness in a pan! We devour them. I’m going to try your way for comparison… No doubt they’ll be delicious too! 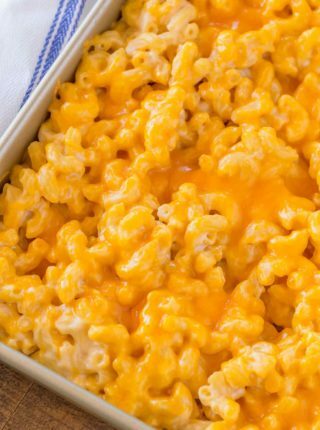 I love how you have such a connection with this dish and it’s been a tradition in your family. Thanks for you suggestion, it sounds amazing! Candied yams with roasted marshmallows is my favorite fall dish!!! I love how simple and elegant this dish is – thanks for all the added tips!! A perfect holiday classic – so tasty! These look SO delicious! I am loving the comforting flavors!